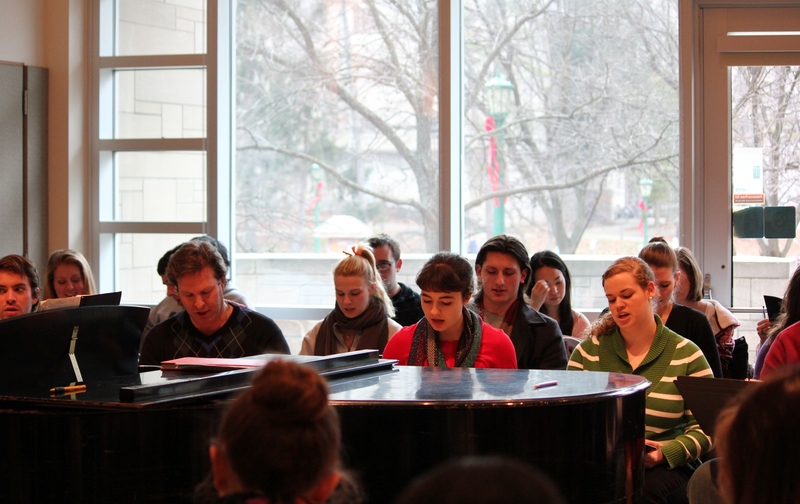 As you are reading these words, all kinds of rehearsals are going on at Indiana University Jacobs School of Music with utmost intensity. The working schedule is six days a week. 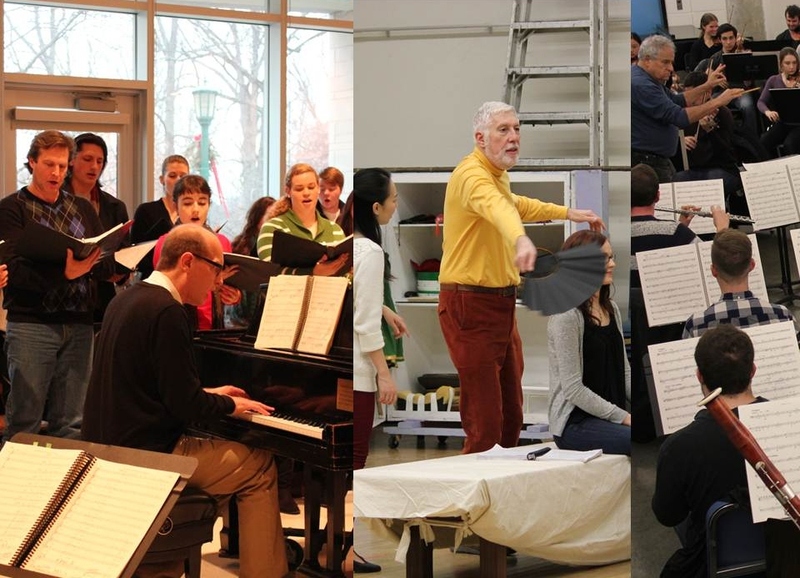 Rehearsals involve the chorus, acting and singing with stage director and conductor, and the orchestra. 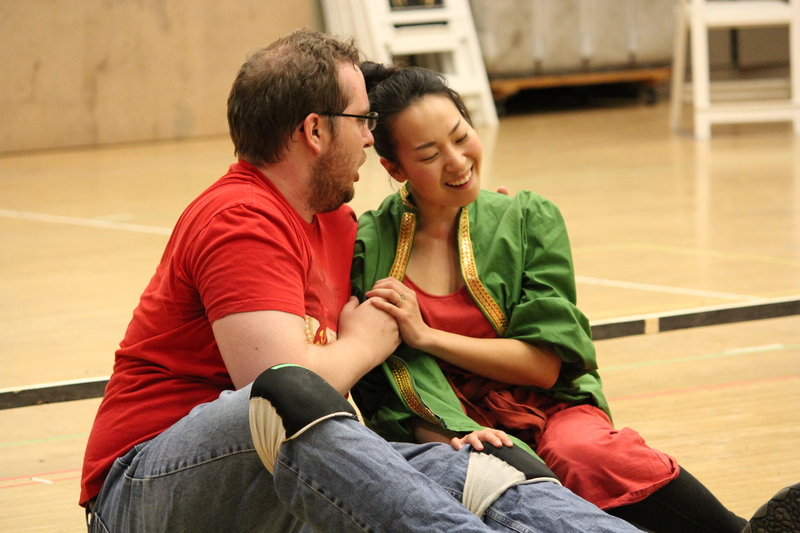 They have less than two weeks to practice before the premiere of The Tale of Lady Thị Kính on February 7, 8, 14, 15 of 2014. Composer and Librettist P.Q. 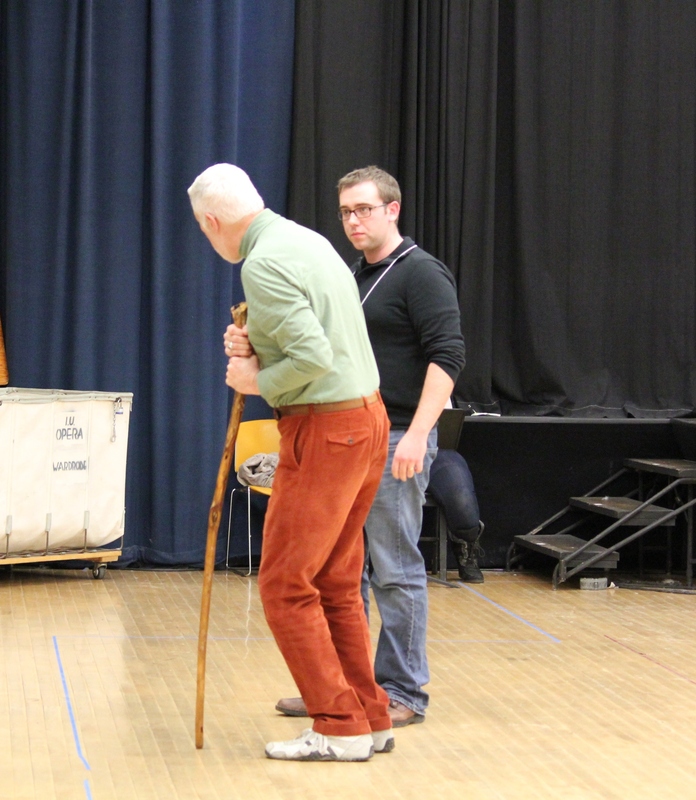 Phan and Conductor David Effron at the staging rehearsal. I described the rehearsal atmosphere at the workshop before. I stand by my earlier observations and think that they should be read before what is coming forward in this article. For the second time I witnessed the rehearsal, these are some of my additional comments. It is amazing how the conductor’s understanding of the opera and the nature of sound shows in his commands. 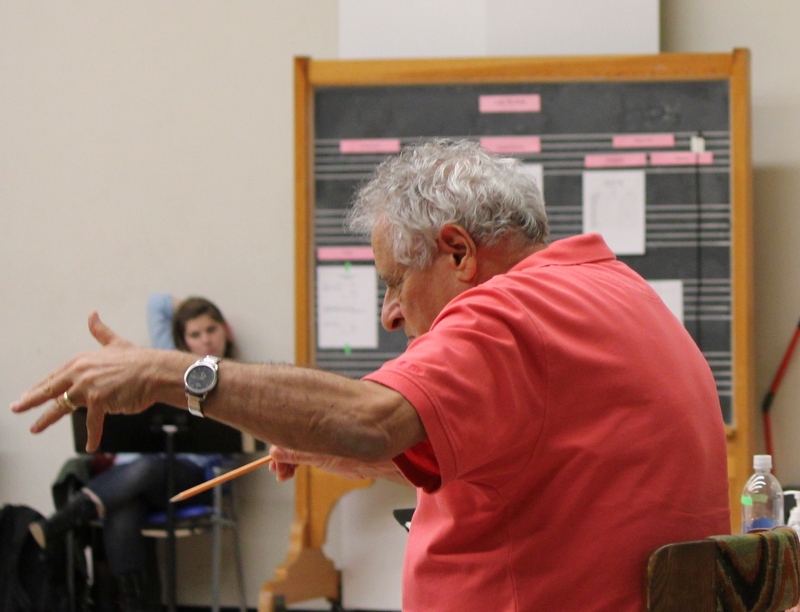 Maestro David Effron could say something like this: “You should sing like Mimi in La Bohème when she’s going to die – with love and tenderness – but not when she’s dead!” [Everybody laughed.] Well, even though you don’t know who Mimi is or what La Bohème is about, you could still tell ‘going to die’ from ‘dead!’ Or he would say: “When you are talking, it is actually singing without pitch because normal talking will not work.” In other words, “you’re tossing your voice to the back of the room” otherwise nobody is going to hear you. Thị Kính and Sư Cụ. My ordinary ears may not detect all the differences in the voice change after the comments, but these comments definitely make me realize the nuances, delicateness, and power in one’s ability to use their voice to express certain hues of feelings in the whole gamut of human emotions. They make me realize how the singing could be cultivated to reveal not only one layer of emotion or feeling or texture or color, whatever your mind and body can perceive, but even some of them at the same time. That is a skill and talent that take years to materialize. “Details such as how a tempo is related to the dramatic feeling of a character, that’s what is important; or how a tempo is related to the environment of the time period or the story in general. I try to do those things. But those things can only happen after you have a basic idea of what to do with a piece. 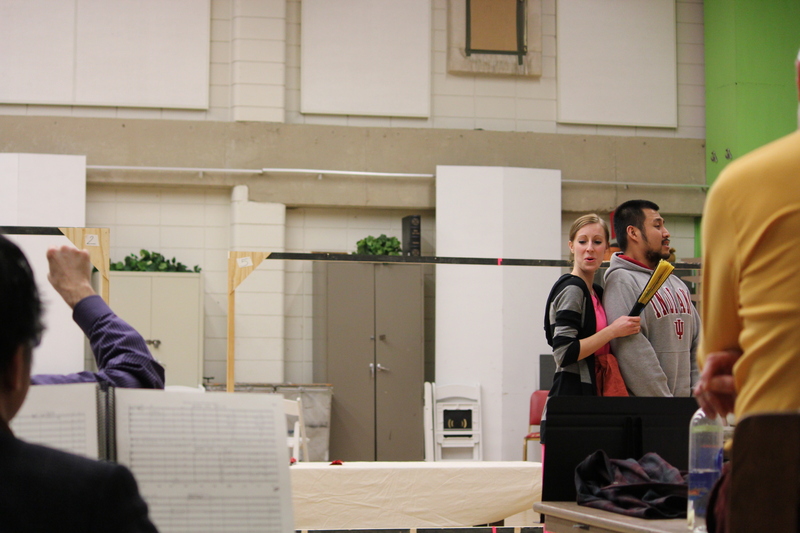 To add many more layers to the singing making it a complete part of an encompassing experience on stage is the acting. Do you know that Thiện Sĩ cannot walk in rhythm in the first scene when he comes out? That is what stage director Vince Liotta told the performer. Why? I guess because this is an opera, not a ballet! Besides, he is Thiện Sĩ not a comical character like Nô so he must behave properly. And when the performers are acting with fans in their hands, the moment they open or fold their fans is not random. In fact, it indicates that character’s change of emotion or thought. Also, keep in mind when you see the show, that the loud sound made by folding the fan(s) abruptly is utilized to enhance the intensity or the drama of the moment. Then when the performers are so focused on the acting they forget about singing expressively, stage director could remind them, to “choose a lighter side of expressing happy thoughts,” for example. Thiện Sĩ and stage director Vince Liotta. Just imagine that every sentence or part of a sentence involves some movement and change of emotional expression. As each character is unfolding and growing along the story, there are layers of ideas, details, thoughts, emotions, movements, etc. needed to be incorporated into the singing and acting to describe the growth and development. Therefore, each movement, each step, each turn of any part of the body, any change in facial expression, any change in the voice, or the enunciation of some words, is thought of, planned, and coached by stage director – with the singing closely monitored by the conductor. 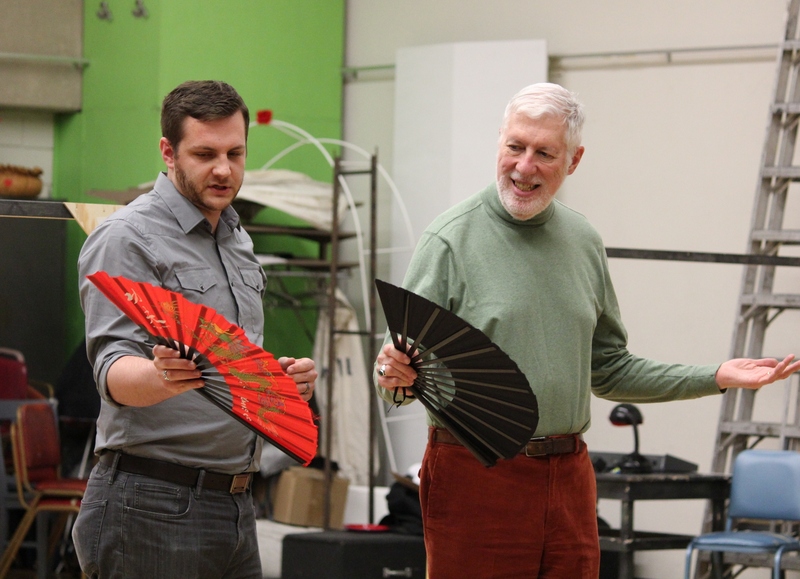 Stage director Vince Liotta and Mãng Ông. This whole process changes the way I think about opera in some aspect. 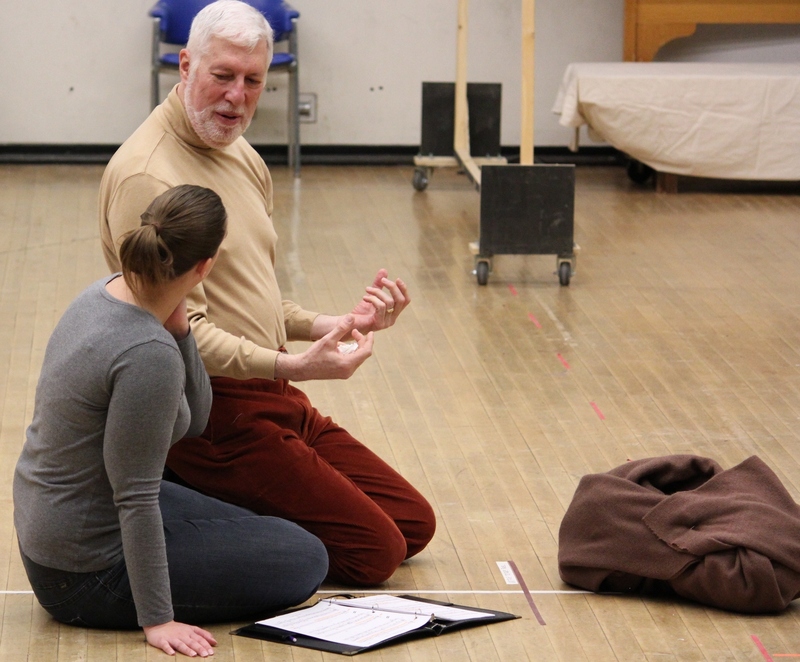 Music is an essential part of an opera, but acting is also crucial. If there is no movement or change in the voice or turn of the body, or wrong movement and unintended change of voice for that matter, the audience may possibly feel the stagnancy or the static in the air, which is when interest is lost and attention dropped. 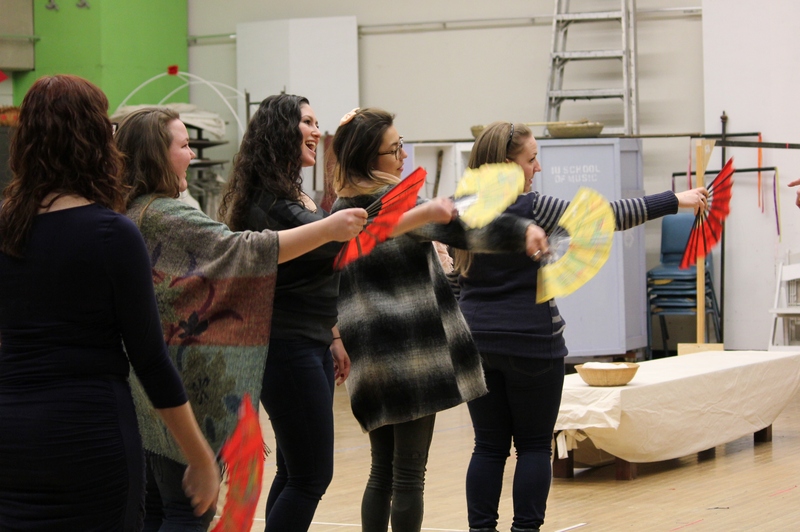 As the singers are learning their characters, it is the stage director’s job to direct and choreograph their every move. By the time they become more and more their characters, they take a more active role in acting. “What we are discovering is that we have taken not everything that is exactly as you would see it in a Vietnamese theater […] but that we have kept enough of the symbols and the icons that make it feel as Vietnamese, as Phan said to me the other day, if anyone Vietnamese looking at this would recognize it as being Vietnamese, and yet, [we keep] it moving and shaped like a Western opera. We’ve done that so far by having chosen the right icons, the right moments, whether that’s somebody using a fan, or the way a character walks, or the way a character stands, offerings in a wedding. We have introduced a couple of umbrellas. It is not quite a wedding ceremony but again those symbols are there that say that we’re trying to make it feel, for somebody who doesn’t know it feels culturally different, and for somebody who does know there are enough things that make it feel culturally appropriate. 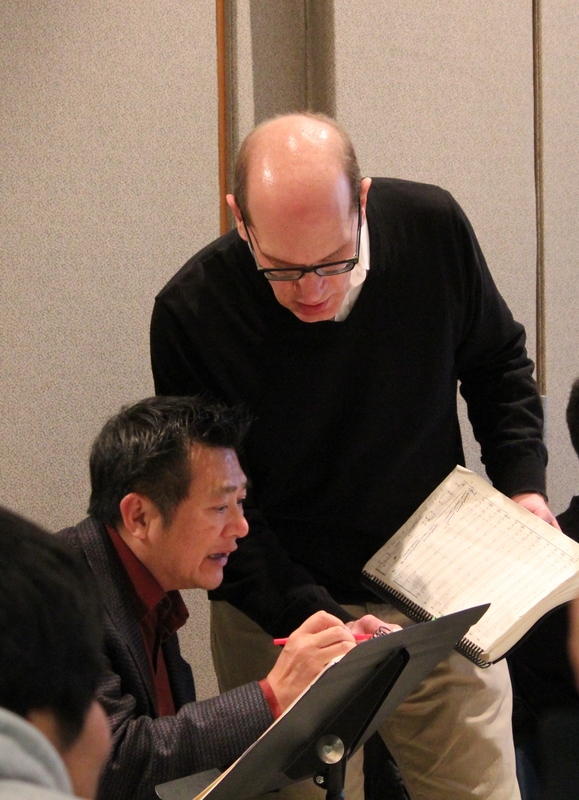 Back of Conductor David Effron (left), Composer and Librettist P.Q. 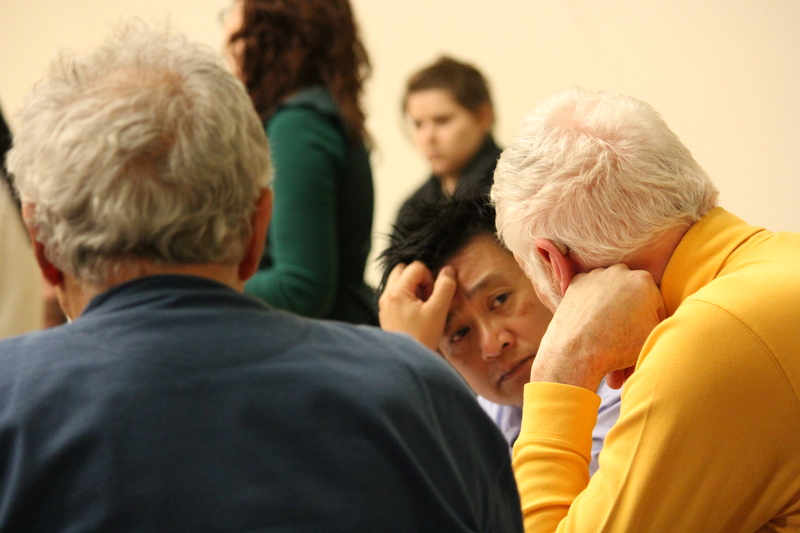 Phan (center) and back of Stage Director Vince Liotta (right) at the rehearsal. Sư Cụ and Tiểu Kính Tâm. Our life is normally in three dimensions. 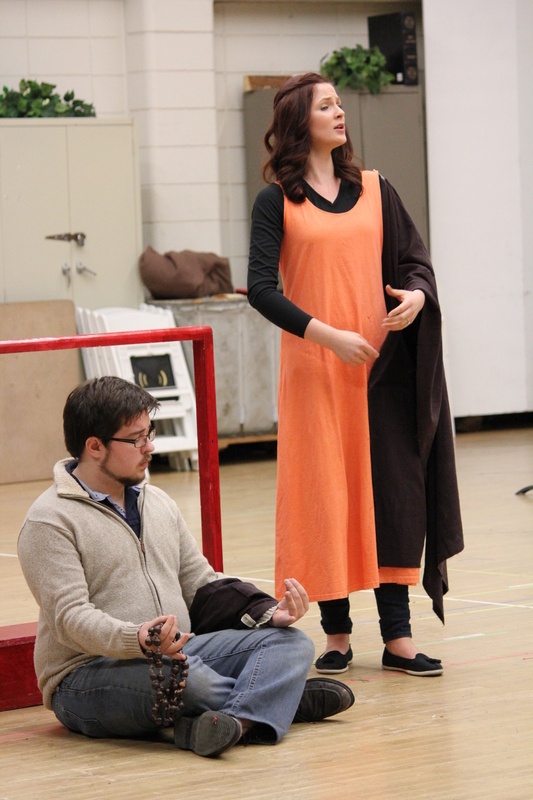 The singers in this case have to incorporate extra elements of singing and acting into the performances. 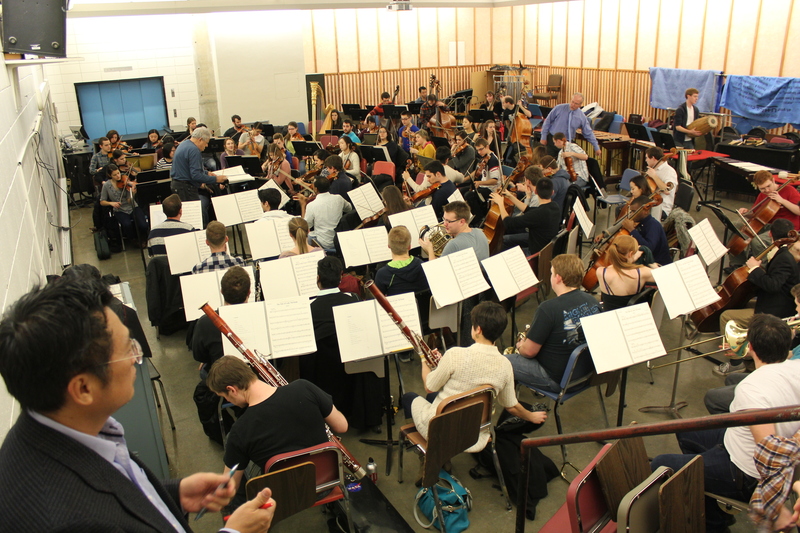 They have to pay attention to the conductor and director at the same time. These turn their stage-life into five dimensions. I feel overwhelmed just by watching them work. 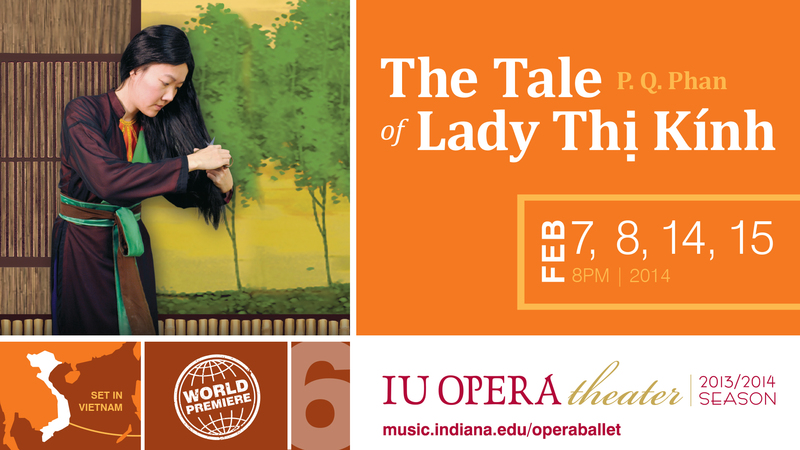 As you are experiencing The Tale of Lady Thị Kính in the audience, keep in mind that for each sentence and movement you hear and see on stage, respectively, they are practiced at least 100 times over. Well, it is a five-dimensional world, what do you expect! I feel grounded on earth. The singers have many layers to dig and by the time they are on stage, they are in the center of the earth. 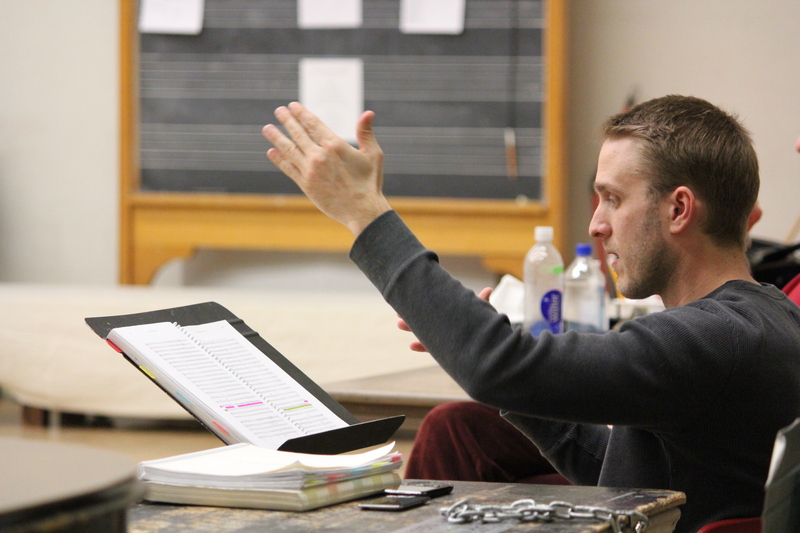 You have seen the conductor working with the singers, mapping out half of the picture that he has in mind about what the opera is supposed to be, musically. The other half of his picture is the orchestra. 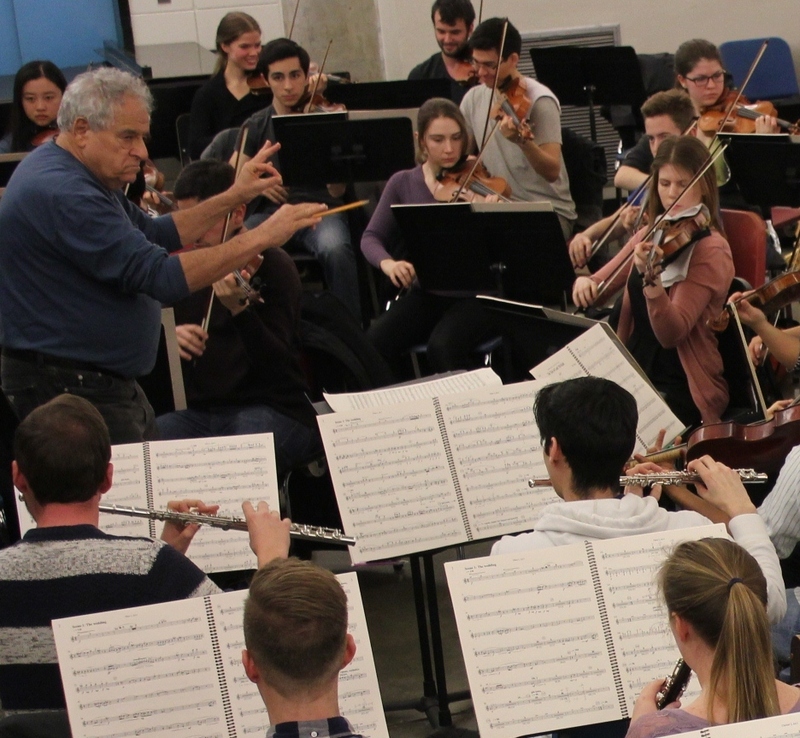 There are a hundred and one fascinating things that I can describe about an orchestra rehearsal, from their tuning in the beginning to the sounds I hear at their 5-minute break. 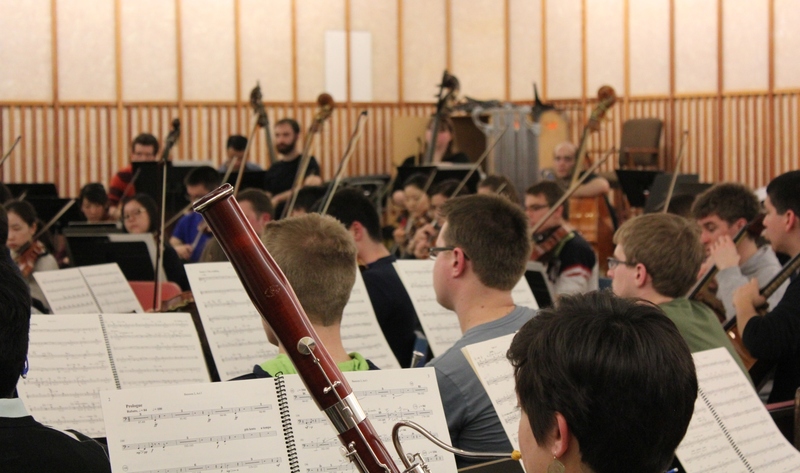 To recap my one-person job with the urgency of time (10 days to the premiere) I would say: A pleasant thing to do with the orchestra is to try to locate which corner the sound is coming from and what instrument it is and how it makes you feel. As more and more instruments join and the music changes, you realize your feelings are changing accordingly. (I am talking about great music and great conducting here.) And you realize how incredible or even magical that is – what is happening to you and inside you. When you listen to the music, sometimes you see a single flower, sometimes a garden full of flowers; you feel the sadness, the happiness, the ugliness of the human souls; you see the thin and thick space; you see light and darkness in the air; you feel textures. ‘Colorful’ is the exact word that comes to mind that makes sense to you. Then you understand what musicians mean when they say, “The music is very colorful!” For one thing, the music of The Tale of Lady Thị Kính is very colorful. Composer and Librettist P.Q. 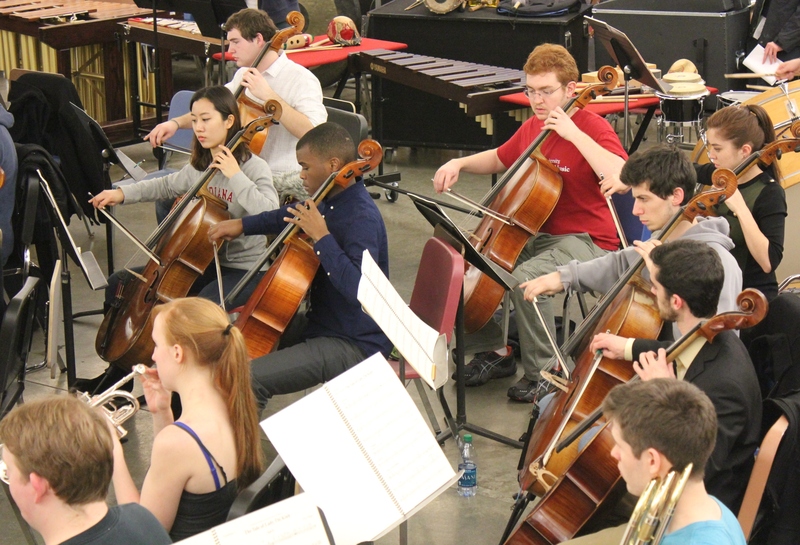 Phan (left coner) at the orchestra rehearsal. 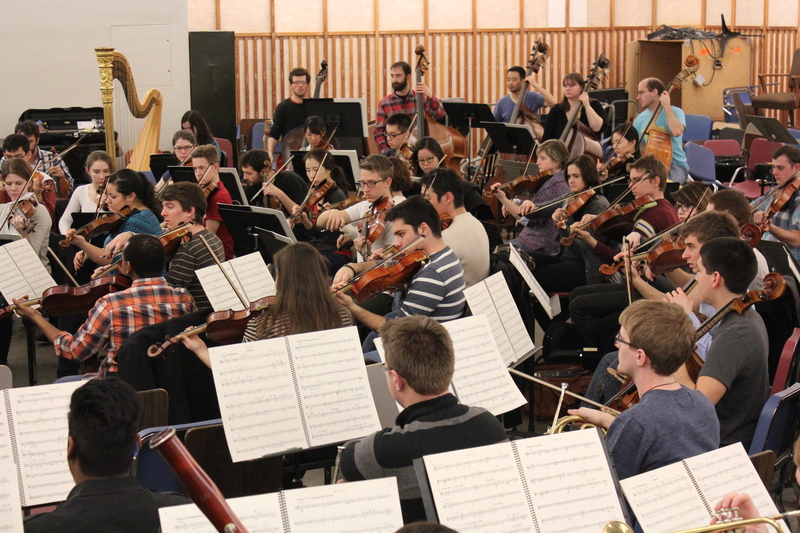 And of course no-one can ignore the power of the whole orchestra of more than 60 performers playing in unison and harmony, and especially the presence of the rare 30 pitch gongs. Together they exude the power that grips your heart and soul. You feel frozen in time for a moment, forgetful in this layer of heaven. There is another layer of heaven? Yes, that is when the chorus arrive. 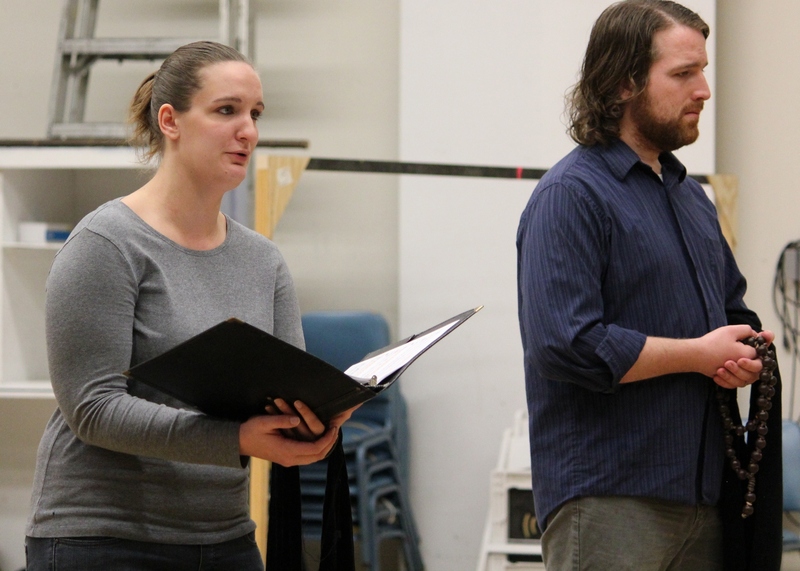 The chorus rehearsal atmosphere could be so energetic it lifts you off your feet with rock-like beats and rap-like singing. It might be an insult to describe it this way, but in some way, to a layperson’s ears, the first part of the practice sounds like that, just because, I guess, that is one way to practice the right beat so everybody knows where to come in and how to keep the right tempo going. Composer and Librettist P.Q. 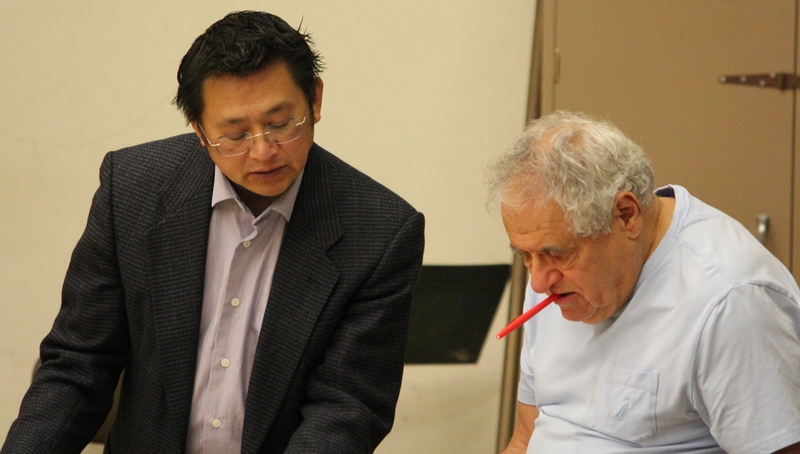 Phan and Chorus Master Walter Huff at the chorus rehearsal. 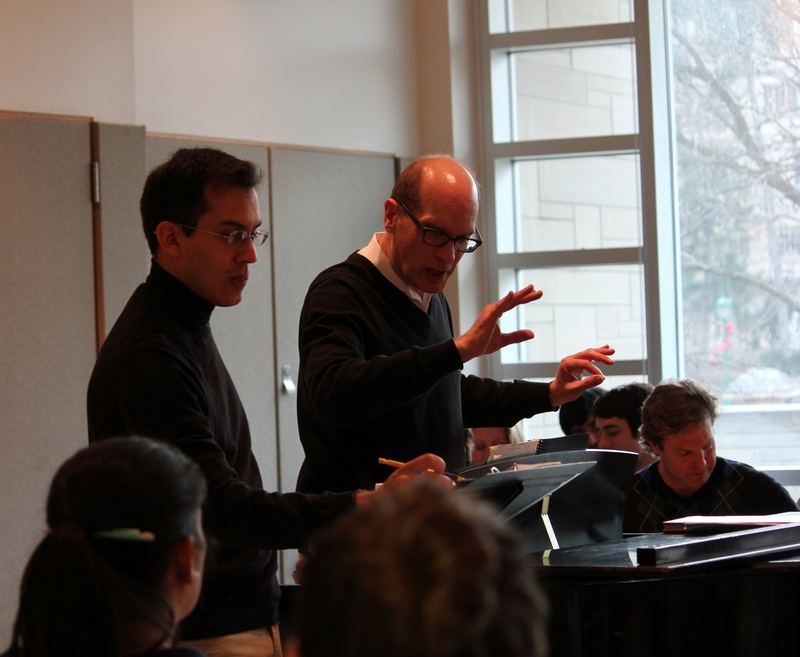 Chorus Master Walter Huff (right) and Juan Carlos Zamudio, Assistant Chorus Master (left). After that, real singing follows. 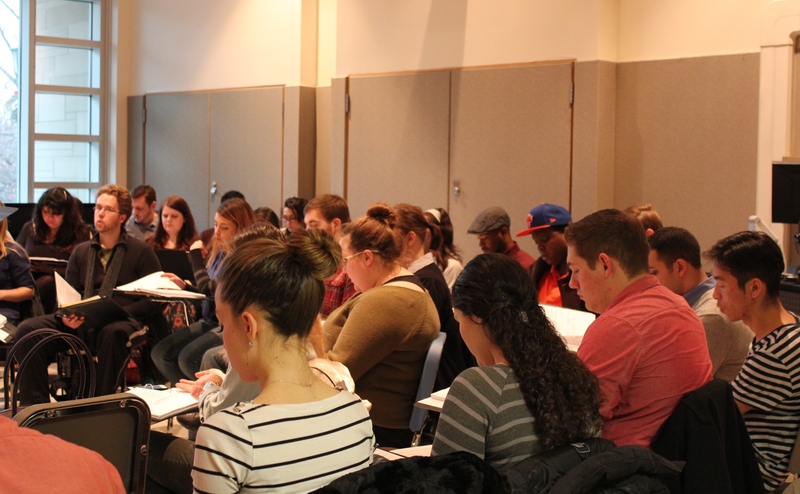 The instructions from chorus master Walter Huff at the trial scene, for example, are for singers to portray satire in the color of their voice and to make it lighter and brighter. And the result is that you will have goose bumps when the chorus singing arises. One way I could use words to describe it is ‘the magical beauty of the mass.’ Without trying to be sentimental, I would say to you: Listening to them, you feel as if you hear the angels singing! Heaven and earth are here. Yet, don’t think you can get away with singing one wrong note or making one improper movement! Maestro David Effron or Master Vince Liotta or maestro Walter Huff will catch you! The Vietnamese version of this article has been printed and published online by the Viễn Đông Daily News. Read my online Vietnamese version.